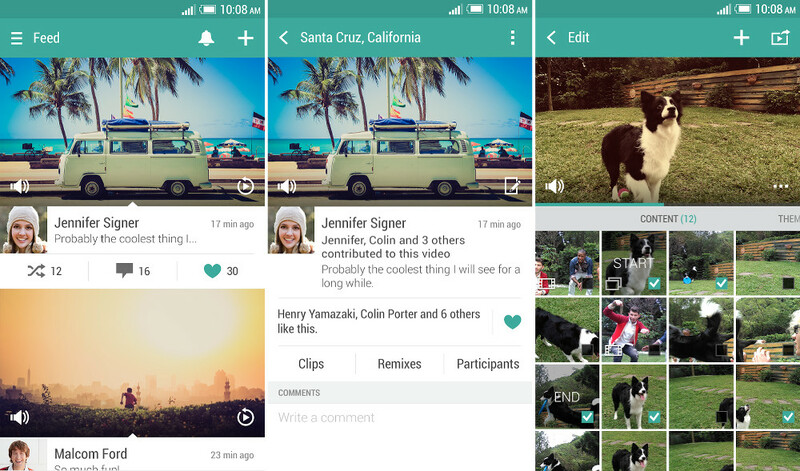 HTC released their brand new Zoe app this morning to Google Play, an app that is like a mix between Instagram and Vine and filters and clip sharing and, yeah. Actually, it’s HTC’s Highlights feature from the One (M7) and (M8) that has been renamed to Zoe, which used to be a mini-clip camera feature that was used to make up Highlights which are now Zoes. Confused? Yeah, you should be. The app’s life is early and in beta at this time, as is noted by HTC in their announcement post. In other words, don’t expect it to be flawless. Zoe works, in a way, like this. You load it up for the first time, sign-in with either Google+ or Facebook, and then add some friends or follow other users. Once setup, you get to start making Zoes! To make a Zoe, the app pulls in clips and photos from your phone’s storage and then lets you choose which you would like to be included. Once selected, those photos and clips make up the Zoe, which is a highlight video with filters and music. You can choose from preloaded tunes or even select from your on-device library. Create the perfect filtered highlight video and share away. Once shared, your friends and followers and creepers can see your clip (unless you set it to private). If they so choose, they can “remix” your clip to make their own version of your Zoe/Highlight/whatever-we-are-calling-it. You can “heart” Zoes, share clips from friends, discover new stuff through the app’s main feed, and ultimately, create quite the community of highlight videos. The app’s UI is well-designed with a bit of Material Design built in and all sorts of swipeable panels. It even has a web portal for viewing Zoes on big screens. HTC Zoe currently works on HTC, LG, and Samsung devices running Android 4.4+. Except, it doesn’t work on the brand new LG G3. Oh, and yes, Motorola is completely missing from the list. Feel free to give it a shot, if you for some reason need another video social sharing app in your life that you need to convince your friends to use.